Durham's Third Way: One Great Bay Community Blazing A New Trail To Clean Water? Durham Town Engineer Dave Cedarholm shows off one of the rain gardens installed as alternative an storm water control in Durham. Several seacoast communities have been ordered to upgrade their waste-water treatment plants by the EPA.But towns are pushing back on the question of how much the plants need to improve. Durham is in that boat. The town is trying a new approach to pollution control called adaptive management. And depending on how things go for Durham, this could be the way the way towns and the EPA will resolve difficult and expensive water problems going forward. To grasp what’s going on in towns surrounding the Great Bay, these are the important numbers to know: 8, 5, and 3. 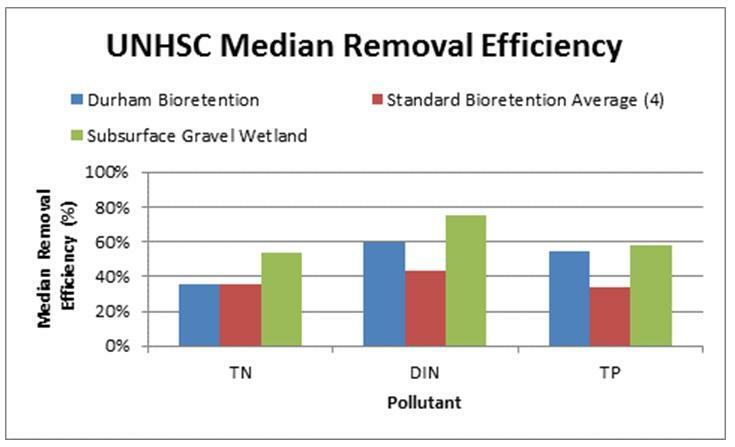 Those numbers are the milligrams of nitrogen pollution per liter coming out of waste water treatment plants. And to outfit a wastewater plant for each step down costs tens of millions of dollars. In-land, the nutrient that has been most problematic for water bodies is Phosphorous, but on the seacoast, Nitrogen is the troublemaker. “Right now we’re at a 30, so that’s the big bite, to get from 30 down to 8,” explains Steve Fournier, town administrator in Newmarket. Newmarket already has their EPA permit, which says it first has to get their plant to 8. If that doesn’t clean up its water bodies enough, the EPA says it will have to keep spending until it gets to 3. It’s a touchy subject. So touchy that other towns – Rochester and Dover – are appealing Newmarket’s permit in court, because they don’t like the precedent it sets. Seacoast towns have butted heads with the EPA over the costs for years now, and so far the courts have ruled in favor of regulators. For some time communities faced a choice: fight the EPA or acquiesce. But the town of Durham is trying to find a third way, and if it works something called Adaptive Management is taking center stage. Leading the charge toward adaptive management is town engineer Dave Cedarholm. perform during extreme events. Cedarholm says he has fifty spots for these installations already picked out. This particular one is nestled in a parking lot in downtown Durham. It looks like a rocky ornamental garden that’s been planted in a depression instead of on a mound. The idea behind these to catch water rushing off of parking lots, athletic fields, lawns – whatever – and stop it before it rushes straight into the local stream. The first inch of rainfall in every storm is the dirtiest inch of every rain storm – that’s the first flush that pushes accumulated pollutants into water bodies. Cedarholm says 96 percent of rain storms are an inch or less, and that first inch is about all a rain garden can handle before it overflows. But letting that inch sink into the engineered soils catches the vast majority of contaminants. However it takes hardy plants to do this job. “See this thing’s totally dead,” Cedarholm explains picking at some brown, withered, ornamental grasses in one of his planters. “It didn’t like it. So I need to find some other plants that aren’t bothered by that, and I think I got them down here. So couple of those, put them in here and we’re good to go!” Cedarholm finishes with a characteristic can-do tone. Cedarholm hopes these gardens can save Durham money. Complying with EPA’s strictest wastewater limits would be very expensive: upwards of ten million dollars in equipment, and a half to a million dollars a year in chemicals. 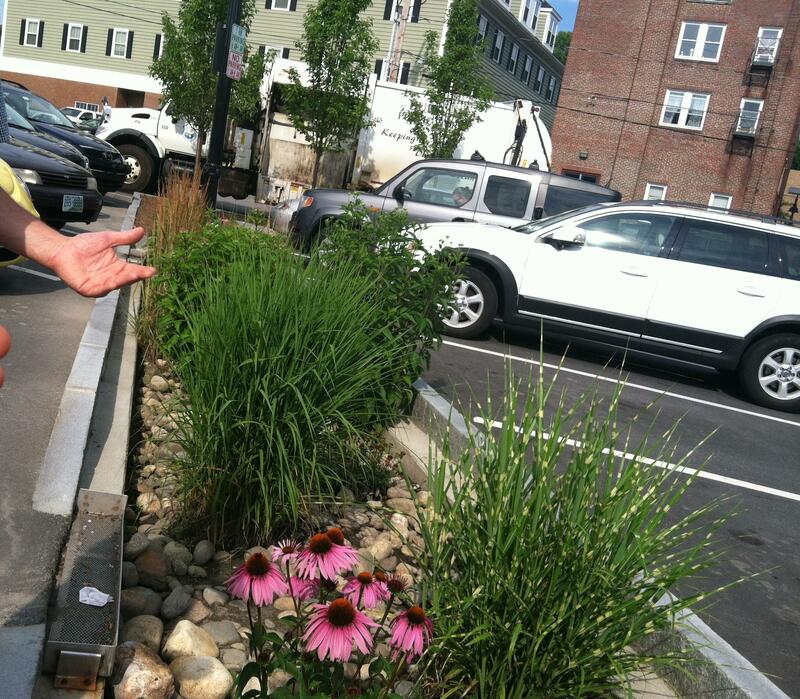 He wants to prove that it can use rain gardens to pull even more nitrogen out of its storm water, and for less money. But it might be a better investment. Which is what Durham hopes to convince the EPA. It is currently conducting a study that it hopes will prove that very point. For Durham the difference between a plant that releases 3 mg/L of Nitrogen versus their current 5-8 mg/L, would be somewhere between 1.5 to 2 million tons of nitrogen a year. Durham wants to show that it can reduce that same quantity through storm water efforts like rain gardens. So far the EPA has been guarded in discussing the specifics in Durham, and say it is waiting for the results of Durham’s study. But are reasons for optimism. Durham began down this road after a memo written by EPA’s top water quality official first sanctioned this approach. One of Durham's first rain gardens was installed at Oyster River High School as a collaboration between the town and a science class. Cedarholm thinks that many rain gardens could function in this way, as citizens become inspired to pitch in and put rain gardens in appropriate spots on their property. What Stoner didn’t say during that visit was whether using adaptive management might an acceptable alternative to the most expensive wastewater upgrades, or if this approach will only buy towns a bit of time before they eventually are required to upgrade. Whether Durham gets the leniency it’s looking for is something the other Great Bay communities will watching carefully.